Elaine's Creative Musings: Wanna have MORE sneak peeks? 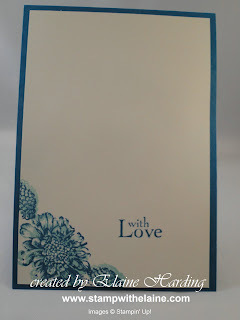 For my Sunday share, here's another sneak peek - hot on the heels of Sale-A-Bration! 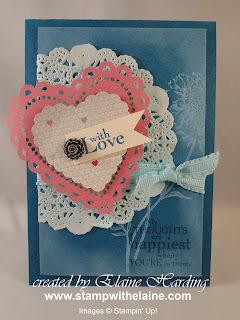 Some of the products on this card will be available on February 1st in our Spring/Summer catalogue! This was one of the cards I demonstrated at the Sandown show. The stamp set I used is called Field Flowers and is currently available in the Annual Catalogue (page 78). The top layer was cut 3 1/2" x 5 1/4". I sponged all the edges with Whisper White Craft Ink. Being a pigment ink, it takes longer to dry. 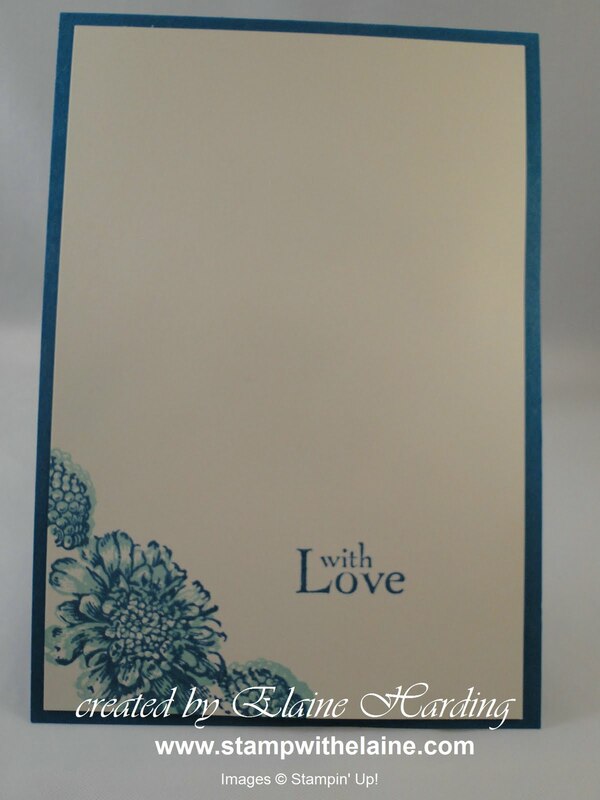 The flower head and stems were stamped in Whisper White Craft Ink too and I used a stamp-amajig to aid accurate placement. I sponged the doily with Island Indigo - the Primrose Petal heart is from a new specialty DSP from the Spring Summer catty. The layers were adhered with dimensionals to the card base and it left a slight gap so that I could slip the ribbon through without it bulking up. Here's the inside. The colours used were Pool Party and Island Indigo. There are 7 stamps altogether in this stamp set. A stem and leaves, two stamps with greetings, four floral images. I finished with a little tag and attached it to the heart with an antique brad. Hope you like it. Thanks for stopping by and enjoy the rest of your weekend.